In order to deliver a truly successful ERP project for a client, ProcessPro maintains a staff of knowledgeable professionals in the process manufacturing industry. They understand your regulatory compliance and certification issues, whether they be FDA, USDA, GHS, Bioterrorism, SQF, BRC or NSF, and have assisted businesses like yours through these initiatives. The combination of industry leading software, in-depth knowledge of regulated process manufacturing and the project management skills and domain expertise of these professionals, allow us to deliver the best overall ERP solutions in the market today. Our proven implementation methodology has successfully delivered hundreds of high value ERP projects to our clients. Our proven implementation methodology has successfully delivered hundreds of high value ERP projects to our clients. Projects can vary in length and complexity based on the unique requirements of individual businesses and projects, with most taking between 6 and 9 months. ProcessPro has developed a flexible, yet disciplined, approach as outlined below, and will guide you through planning, implementation and ongoing system utilization. This phase marks the beginning of the project and includes outlining roles and responsibilities, defining a communication plan and identifying required hardware. 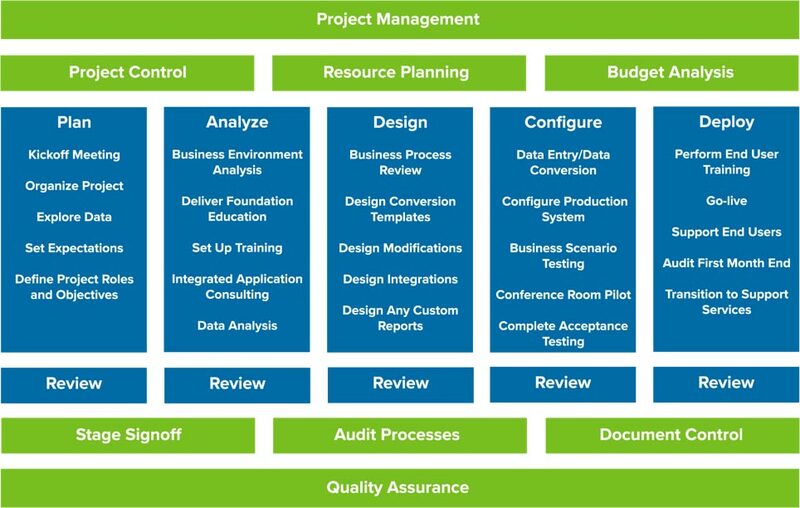 This includes a pre-implementation Analysis in order to ensure that your unique business requirements and opportunities for improvement are identified. A detailed review illustrates how your key business functions will work with our software, including data conversion and training plans. ProcessPro’s data conversion tools and expert training assistance allow you to manage the conversion of key data for your new system. Any unique changes to our software are identified and made. Training sessions are performed during the process, including performing transactions in your new system. ProcessPro experts assist with testing plans for converted data and unique configurations. Once the software is live we assist you in any last minute training and adjustments, help you through your first month-end close and transition your business to our support organization. We will return to your organization to conduct a complete analysis of post go-live utilization and provide a comprehensive plan for ongoing utilization improvement. Bob Miller, Controller, Pacific Nutritional, Inc.